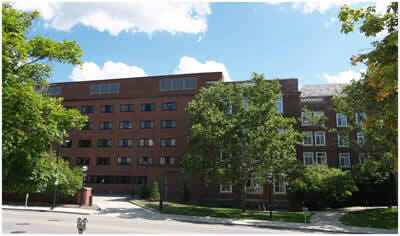 Couzens Hall is an approximately 180,000-gross-square-foot residence hall housing approximately 560 students. The renovation will repair and update infrastructure, including: new plumbing, heating, ventilation, fire detection and suppression systems, wired and wireless high- speed network access, renovated bath facilities and accessibility improvements. New spaces will be created in the vacated dining areas that are no longer needed since the Hill Dining Center became operational. New and reorganized spaces within the facility will revitalize the old residence hall and create spaces for living-learning and academic initiatives, student interaction, and creation of community. The energy performance of the overall building will be brought up to our current design guidelines by: adding insulation to exterior walls where feasible, replacing most of the glazing and/or window systems, adding occupancy sensors for ventilation and lighting system control, providing energy-efficient heating and air conditioning systems, as well as other energy conservation measures.